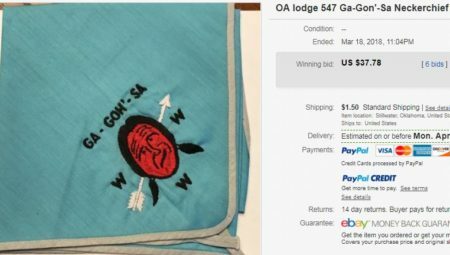 An auction recently ended for an older neckerchief from New York State OA Lodge. Ga-Gon’-Sa Lodge #547 merged with Chautaqua Lodge #165 to form Ho-Nan-Ne-Ho-Ont Lodge #165 in 1975. The auction started at just $ 5.99. Four unique bidders made 6 bids before the auction ended at nearly $ 38.00.